We need your assistance to stock up our shelves! for OUR Easter Food Basket deliveries! The 5 Loaves and 2 Fishes Ministry is very thankful to report that the food items received at Christmas and since then have been a real blessing to a number of families in need on a regular basis. Praise God!! However, this means that our supply is once again in need of replenishing as we near the time for our Easter Food Basket deliveries. 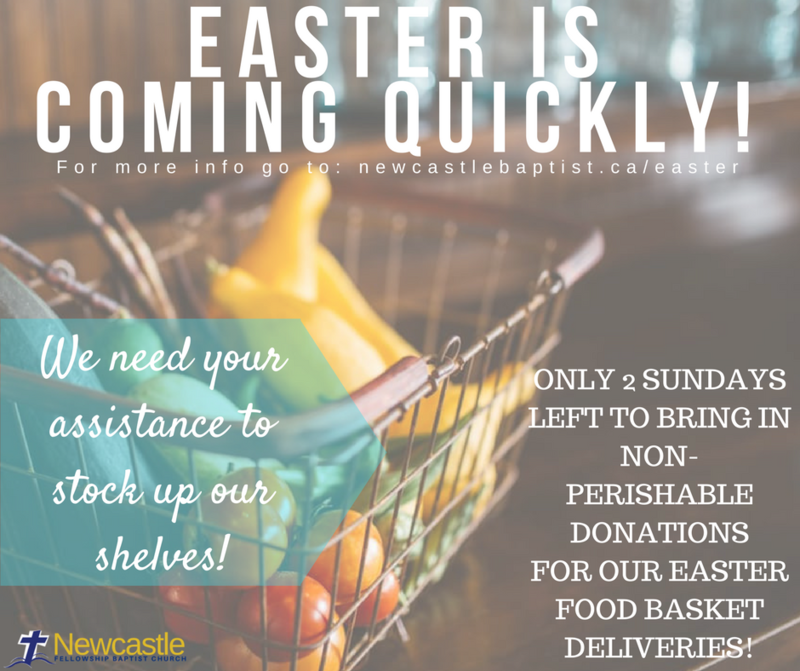 Next Sunday, April 9th, will be the final collection date for donations, as we will be packing and delivering the food baskets the following week, in time for Easter. Last Christmas we provided 10 food baskets to individuals and families in need, and we are expecting around the same number of baskets are needed for this Easter. Therefore, we are reaching out to you to remind each family to consider contributing to this very important ministry as you go about your grocery shopping this week. Please see Will Metcalfe this Sunday if you prefer to give a monetary donation that can be used to purchase both perishable and non-perishable items to meet the needs. Also, if you know of someone in our community in need this Easter, please contact Will or Ruth Metcalfe ASAP at (905) 809-8325 or rufreddy@rogers.com. Please continue to pray for this ministry and for all recipients that our actions would be a reflection of God’s great love and His perfect sacrifice for us. Pray that God may use this ministry in ways we can’t imagine and be a great blessing to our surrounding community. Thank you for your assistance and prayer support!